Pavi's Platter: Couscous Kisir ! Couscous is one of my favourite ingredient these days. It is very low in calorie when compared to rice and very good alternative to rice and pasta. 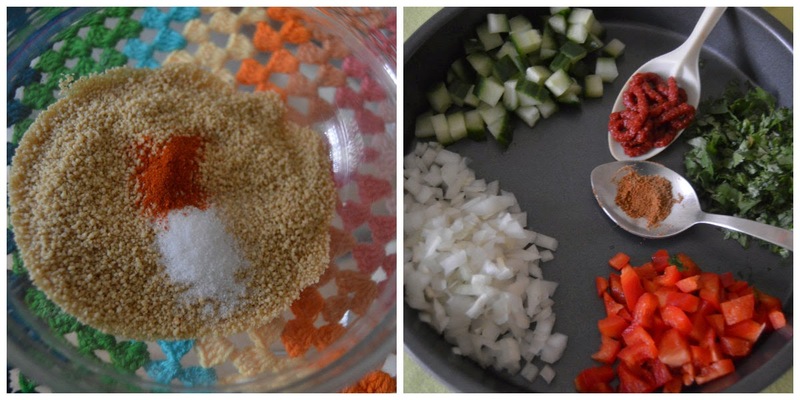 We can make couscous in a number of ways and add anything we like to it. It is mostly made as salad with fresh raw ingredients like onions, tomatoes and cucumbers. Today i made this couscous in turkish style. Kisir is generally made with bulgar wheat drenched in oily tomato paste with onions and cucumbers and lot of parsley and cilantro. Just replaced bulgur wheat with couscous and it turned out good and it was very filling. a fistful chopped parsley and cilantro. Take the coucous in a bowl and add salt and paprika and mix well. Add boiling water to it (1 part couscous needs 1.5 parts of water) and give a mix. Keep it closed and leave it for 10 minutes. After ten minutes you can see all the water absorbed by couscous. Fluff it with a fork and keep ready. Heat a pan and add the olive oil to it. Once hot add the onion and saute them for a minute. Add the pepper and saute it for another minute. Throw in the tomato paste/puree and mix well. Let the tomato puree cook in the oil. Add a little salt for the veggies and mix well. Now turn off the stove and add the couscous and mix well in the oily tomato paste. Sprinkle the cumin powder. Add the cucumber and parsley and cilantro and give a nice mix. Pour in the lemon juice before serving. Happy cooking and healthy eating guys ! Mullangi Thuvaiyal / Radish Chutney ! Cheesy Veg Quesadilla with Guacamole ! Chinese Chicken Fried Rice !